Palais Soleiman is located into an old palace of Marrakech, Noth medina. Near Riad Aguaviva and Bab El Khemis. “This was once the place from the lords of Marrakesh: the Caïd Layadi. Palais Soleiman restaurant offers an extraordinary architectural example of preservation: ceilings carved and painted wood, antique zellijs and majestic spaces. “My husband and I enjoyed our last evening in Marrakech at this palace where part of it has been made into a restaurant. The traditional Moroccan food was exceptional as was the friendly service. We particularly enjoyed the music and deluxe decor. Treat yourself to an exotic experience at this fabulous place”! We have been out for a couple of ours exploring the atlas, whenever back the tour guide said we should try this place! We actually know how such things work (the driver gets a small fee) if he brings customers in. So in 95/100 cases we say: no thanks! However this one was special already since he started to speak to us about the place it self! We had a private tour so there was no other people. 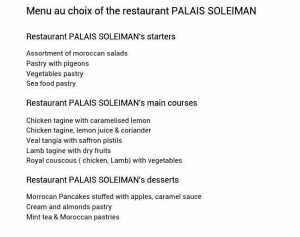 He told os there are 100 restaurants with oriental music and bellydancers but there is none like the palais soleiman. Arrived there we fall in love with the decorarion, with the flavors you could smell in the air and of course later with the spectacular food and show! by taxi: Ask you to the taxi driver : “Palais Soleiman”. All people know this restaurant nearest to Souk el Khemis and Bab el Khemis. North medina. ADRESS: Dar Layadi, Kaa machraa, Marrakech, N8, Marrakesh 40000, Morocco.